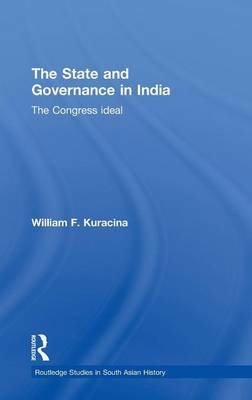 This book presents an innovative investigation of the policies of the Indian Congress during the late colonial period. Departing from the existing historiography of Indian nationalism, it analyses the extent to which Congress elites engaged in processes intended to foster nation-building in India. Rejecting the long-standing premise that the Congress primarily sought to generate a national identity, the author hypothesizes that Congress elites knowingly grappled with the creation of a national governmentality. He argues that they distanced themselves from lethargic nation-building exercises and instead opted to support more practical and more feasible state-building efforts. Accordingly, this book shows that Congress elites constructed the institutions that would enable Indians to govern themselves after India's liberation from British imperialism. It presents evidence which shows that Congress elites began to perceive themselves and their organization as an emerging post-colonial state.